If you’re a long-time WordPress user, then you might have noticed that there hasn’t any been major changes to the WordPress visual editor over the years. It’s not an actual cause to worry and it’s not entirely a bad thing especially if you’re not so keen on changes, but with other platforms offering unique and fresh takes to editing for writers, it’s high time that WordPress steps up to the plate. The new Gutenberg WordPress editor has been created through the efforts of contributors and developers to help writers create rich content while making the task easy and enjoyable, at the same time. In this article, we’ll discuss all you need to know about this new editor and why you need it in your arsenal. Now if you’re familiar with the name, you’ll know that Gutenberg came from Johannes Gutenberg, the inventor of the printing press over 500 years ago. Gutenberg’s goal is to make layout easier especially to those who are new to WordPress with the current visual editor that uses HTML and shortcodes to work. If you want to see Gutenberg in action, you can do so by viewing this sample. 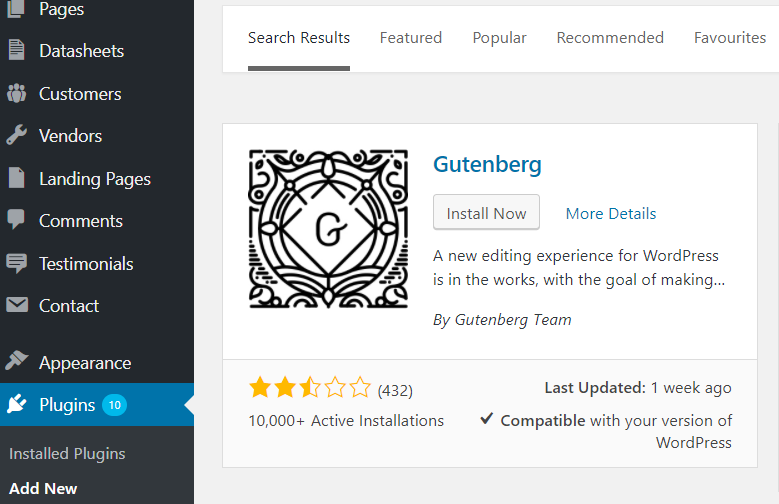 As of writing, and if you check the Plugin Archives now, you’ll see that Gutenberg has a 2.5 out of 5 star rating from over 400 reviews with more than 10,000 active users. As with all other plugins, installing Gutenberg is a fairly easy task. All you have to do is to head over to the Plugins page and search for Gutenberg through the archives, install and activate. Before installing, make sure that your WordPress version is compatible. As soon as you install Gutenberg, head on over to your posts and you will see that you can access the Gutenberg editor included in the links under your Post title. You will see in the image below that you can choose “Edit” which is the link to open Gutenberg and “Classic Editor” which will redirect you to WordPress’ native visual editor. You will notice that the dashboard looks entirely different from the native visual editor as soon as you open the Gutenberg editor. You may find yourself adjusting to this new editor because it’s different from the one we are all used to, but that shouldn’t hinder you much. The Gutenberg editor is user-friendly as far as user-interface is concerned. Switch to Draft – this lets you unpublish the article for editing purposes. Preview – similar to the native visual editor, this lets you preview your article to see what it looks like upon publishing. More button – this lets you access more settings as show in the image below. As you can see, the settings let you toggle between the visual editor and the code editor as well as set the toolbar to appear on top instead of the right-hand corner. On the other hand, the settings found on the left-hand corner enable you to add blocks, undo and redo your editing. With the Gutenberg editor, you can add and edit by block just by click the insert icon on the left-hand corner. Gutenberg lets you have a dynamic take on creating and publishing articles with its ability to add features not initially available to the regular visual editor. It’s not to say that the visual editor is bad. It’s that its features are somewhat limited and does not offer other features which can improve publishing articles. With that said, if you want a fresher and unique take to your blog, then the Gutenberg editor is for you. If you want to try it out and see for yourself why it’s fast becoming a favourite among writers and publishers, then go ahead and install it. It’s free to use. We encourage you to give it a go. Have you tried the Gutenberg Editor yet? If so, what can you say about it? Do you have other great visual editors to recommend? Let us know in the comments below!